Musicals. A genre which has been dead and buried for almost forty years. Since that fateful day when they fell to their demise, there have been attempts at revival (Michael Jackson's The Wiz) which have generally failed, there have been films that have dabbled with a little music (My Best Friend's Wedding, Muriel's Wedding ) and now we have what has to be one of the most exhilarating experiences ever captured on film, Moulin Rouge. It may sound cliched but this is truly a film where you will laugh and you will cry but most of all you will want to break out in song, and dance up a storm. And what storms are danced up before our eyes in this lavish production! 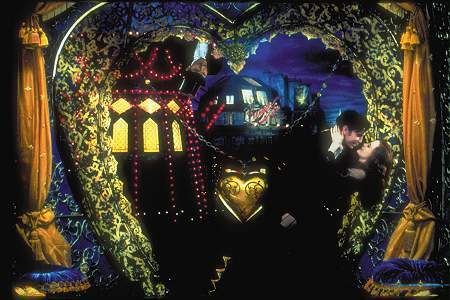 The key point on which a musical must succeed is the music, and Moulin Rouge tap dances gracefully over this hurdle. Each number is inspired and thrilling. Basically, throughout the film there are three types of songs: the love songs, the comic songs and the intense songs. For me personally it was the latter two that were most affecting. The comic songs, which are high camp and parodies of the musicals that drenched the early 1900's, induce rip-roaring laughter. The choreography, lyrics and music (which is mostly a variation on some of the most famously known tunes of our time) all work splendidly and frenetically to put you in fits of laughter. I absolutely loved Zidler's rendition of Like A Virgin accompanied by the repulsive duke. The intense songs as I have so aptly titled them, are just that, INTENSE. They will grab you by the throat and throw you into the film. Draw on every emotion you have welled within you and shake you thoroughly in your seat. Look out particularly for a splendid mix of The Tango and Roxanne. Now this is not to say that the love songs don't work. In fact, quite the contrary they soar. And if you are a female they might touch you beyond words. Ewan and Nicole have absolutely fantastic voices and the orchestral symphonies will have you swaying. But as a dateless sixteen-year-old boy I think I will stick to intense comedy. But the film is not simply a litany of music videos shot together. By no means no. It is a passionate if slightly simple love story that just happens to have some of the greatest musical moments, sets, costume designs and locations thrown in for good measure. And the thing that brings all these elements together so magically is its "visionary" director, Baz Luhrmann. His attention to detail and insistence on every frame of film being beautiful is truly what makes it special. It was his vision and he is the one that made it ours. Helped of course by the wonderful, over the top performances of all the actors involved he has created a movie that is affecting, personal and absolutely brilliant. Some critics have complained that the love story is too simple. But I think that in those times, and in this situation it would have been simple, and it is the simple choice that courtesan Satine has to make that devastates both her, Christian and the audience. It has also been noted that it was too quickly cut, but I had no qualms. To me it only helped to sweep me along. It is such a pleasure to see an Australian film of such fun and freedom and I can't wait to see what Baz has up his sleeve for all of us next time.